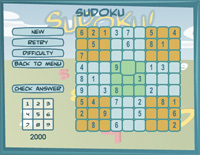 In sudoku there are only a few basic rules. You have to fillin the 9x9 grid so that every row,e very column and every 3x3 box contains the numbers 1 through 9 which means that there cannot be an overlap of numbers in any row column or 3x3 box Soku is a speed version of sudoku. In soku theere is another rule that states tat every row or collumn in any 3x3 box contains the same set of numbers.